Looking for the outstanding professional development opportunities closer to you than Palm Springs? Have you attended the CUE Conference and wished you could bring it back with you to your school or district? 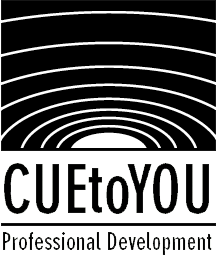 CUEtoYOU Professional Learning Services seeks to provide powerful professional development solutions for schools, districts, counties, affiliates or regional training centers. To schedule a CUE Professional Learning event, contact the CUE Professional Learning Coordinator (below) or complete the CUEtoYOU Request Form. CUE "Lead Learners" are K-12 and Higher Ed educators drawn from CUE's exceptional roster of conference presenters, experts, and thought leaders. These are not merely instructors or trainers. CUE embraces the belief that the best leaders are also learners. Through the CUE Speakers’ Bureau, Lead Learners are also available as presenters for break out sessions and keynote addresses. "He who learns from one who is learning drinks from a flowing river." Each hands-on workshop will walk participants through the use of the equipment in a K-12 (or Higher-Ed) educational environment, provide resources and "take-aways" allowing for immediate implementation, and offer thorough training in the features and use of the equipment or software. Additional formats such as presentations for breakout sessions and keynotes are also available through the CUE Speakers' Bureau. Popular topics include the Google Workshop for Educators, iPad in Education, and the Microsoft Teacher Professional Development Series. Other topics include the Hyperstudio Workshop for Educators and a variety of workshop packages that each include a series of different topics, including Web 2.0, multimedia, and equipment-based sessions. Any session represented at the CUE conference is also available through CUE Professional Learning. Custom workshops are also provided. If you are interested in a particular topic that is not featured here, contact us so we can discuss your needs. CUE can draw on an extensive list of conference presenters and educational technology leaders to supplement your own professional development resources. With group registration your organization serves as the client. You select the workshop topics and determine the dates, times, and locations. You let CUE know how many people will be attending, but the roster is completely up to you - and you can handle registration any way you like. CUE will invoice your organization directly. With individual registration your organization serves as the host of the event. You still select the topics and determine the dates, times, and locations. Then CUE facilitates an online registration process through which individuals can sign up for (and pay for) specific workshops. Your organization hosts the event, but is never invoiced for the workshop. Note: Individuals registering online need to be current CUE members. If they are not current members or need to join CUE for the first time, they can update their membership at the same time they register. To schedule a CUE Professional Learning event or for more information, contact the CUE Professional Learning Coordinator or complete the CUEtoYOU Request Form. NOTE: CUE does not provide support for any equipment provided in its workshops. We defer to the warranty and support materials provided to you at the time of the workshop.